While I was coloring a pencil light bulb – I almost hoped a little bulb would appear over my head! 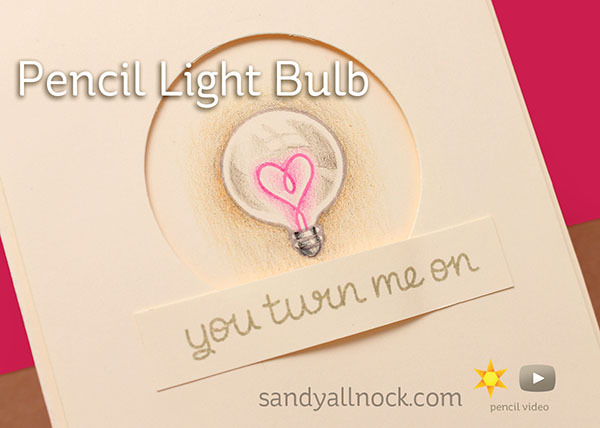 I’ve been on the lookout for the perfect small image to use to get in close on my pencil technique – and this sweet little light bulb was just right! I wasn’t sure how large it’d be when I bought it online, but it’s super teeny. Perfect for making a bunch of these for my church fundraiser! Watch the video below, or click HERE to see it in HD on YouTube. It’s always interesting to see how ‘light’ images get, even on colored cardstock like this cream Neenah, when dark colors surround them! I attempted the shading in the bulb and it’s a mess! Lol but I tried and I’ll try again. Thanks for encouraging us to keep trying. Wow, you brought that flat bulb to life with just pencils! Loved watching your process and your tips! Love the use of the prisma color pencils. I have the set of 12. Can you tell me which set I would have to purchase to get a complete set of all the prisma colored pencils? Thanks so much and I love the video- that technique can be applied to many different “glass” items! You said something today that FINALLY got through. I’ve taken many art courses in college and numerous ones on-line and tend to do illustrative type work. Coloring is always too soft but I have a terrible time adding darks and when I do, I tend to cover the piece with dark. No happy medium for me. My Mom was the same and never mastered it. So I can blame my genes or Get R Dun by trying. You said contrasts is how we see. I could picture it since while you said it, I was watching a creme colored paper become whiter and whiter as you added the yellow. MAGIC as the light bulb came on in my head as well. Finally I see why the contrasts work and how I can make mine more interesting with darks. You have no idea how this is important to me. Thank you once again for sharing your talents! Very cute card and fun to watch your process in creating it. I really enjoy all your videos using colored pencils. Adult coloring books caught my attention and I am just learning to use them. Thanks for all your work. Thanks for sharing CHA with all of us on Periscope. I have not figured out how to comment there. I love all you do. You truly inspire me to try new things. I’ve been meaning to write to you and ask if you would do a wine glass with reflections – but I think this may give me the information I need to proceed with that project – but I can see I’ll need to try a light bulb, too! Thanks! I love the shading and reflections on the bulb! Your understanding of light, shadow and dimension is phenomenal. Thanks for sharing this happy little image with us! LOVE your pencil video. The bottom (silver part) of the light bulb looks so real and the light bulb looks 3D…really neat card. Awesome. This will sell fast.